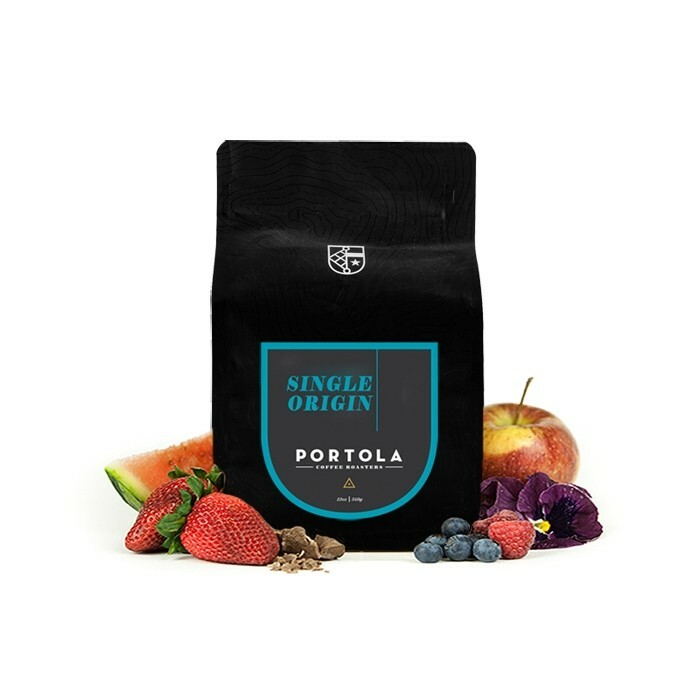 The Ethiopia Ardi was carefully roasted for you by Portola Coffee Roasters. This full natural coffee was grown by the various small holder producers in the Kilenso Moconissa, Sidama region of Ethiopia between 1,850 - 1,950 meters above sea level. We love this coffee for its nuanced notes of berries, floral aroma and juicy mouthfeel. Fans of 'fruitbomb' coffees will particularly enjoy this one. *Edit: I'm retroactively changing this to a 5-star coffee. I played around with extraction times and this coffee really grew on me. Amazingly aromatic, sweet, and juicy. Very good natural processed Ethiopian. I'm particularly fond of this combination of region and processing method and Portola Roasters have provided a solid take on it. A little less "fruit bomby" than I was expecting given the description, but still full of the dark fruit and clove flavors typical of a dry process bean. For comparison: Bar 9's Hachira dry process Ethiopian was a much brighter fruit bomb, this one was a little more muted. Would still drink this any day though. this was delicious, very pure and clean tasting. Maybe my favorite from my subscription so far. Fantastic balance of fruit and vanilla! Fruity, floral, and juicy, just as described, but with a perfect roast to balance and smooth it out. One of my favorites so far for sure! This is the best coffee we have received thus far. That being said, on a relative scale, this is a pretty unremarkable natural Ethiopia. It hits all the marks for what it should be, but in my opinion, crutches on the processing rather than being an exceptional, unique coffee. From smell to taste, I found these beans to be blueberry heavy with a hint of floral (can be adjusted with brew time). In terms of acidity, it wasn't overpowering and complemented the taste of the coffee. Overall, I really enjoyed these beans and would give them 4.5/5 stars. With all that being said, I found these beans to be a bit one note. I’ve tried adjusting my ratios, technique, etc to get more out of the beans but I wasn’t able to. The blueberry was a bit overpowering and it was hard to taste anything else besides the floral. Although these beans were solid, I can’t imagine drinking these beans for a month straight (what I consider a true 5 star). I do enjoy complexity so this is probably what is missing for me. Loving this Ethiopia from Portola. I'm a huge fan of fruitbombs, so this one is right up my alley. The aroma is fantastic on this one, I smell blueberries but that probably isn't correct. The acidity is bright, and the mouthfeel is light and juicy. I was fairly indifferent to this coffee from the start. I thought it had a fairly strange taste to it and wasn't enjoying it much. The coffee has grown on me as I've drank it more. This coffee is awesome. Very nice acidity, full of fruity notes with a smooth, chocholate like finish. Wishing it was Summer here in the Midwest. This coffee would likely make for a great cold brew! I think I liked this coffee about as much as the Kenya. I liked the roast level. I enjoy the light roast. It might have been a little fruitier than I typically enjoy, but I do enjoy a fruitbomb coffee once in awhile balanced with less fruity coffee sometimes. Hope this is helpful! -Was the Ethiopia Ardi better or worse? Was the coffee acidic or sour? Bitter? Burnt or roasty? Was the color of the bean lighter or darker than what you typically enjoy? Portola coffee never ceases to impress! Great pick! Juicy is the word. It took me a little longer to dial this one in but, once I did I really enjoyed it. The mouthfeel is exactly what I look for in a coffee and its the berries are certainly present throughout. If there's a comparable alternative in natural process I think it would hit the nail on the head for me. on par with the best ethiopian beans I've had from Ritual, Blue Bottle, etc.